A major highlight from day 3 of the Southwest road trip: Big Bend. All photos by Escape Brooklyn. 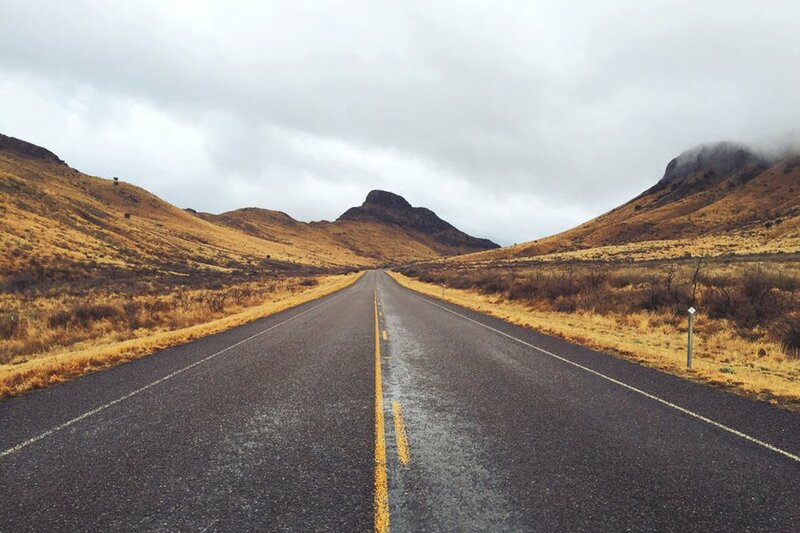 When winter turned bitter in NYC, Erin Lindsey and Denny Brownell of Escape Brooklyn had the great idea to take a week-long road trip through Southwest. They shed some layers, took thousands of pictures, Instagrammed on Fathom's behalf, and collected their fair share of vintage paraphernalia along the way. Here's a recap of the highlights, day by day. 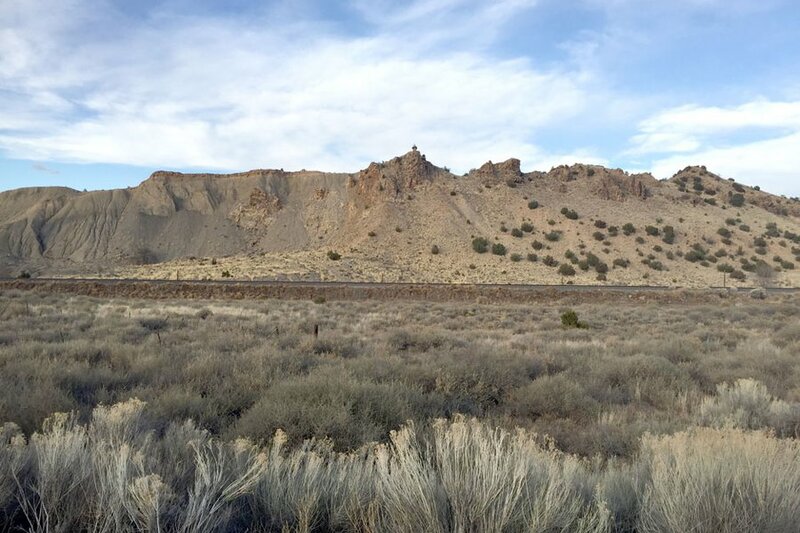 THE GREAT SOUTHWEST – In March 2015, Denny and I road-tripped from West Texas to New Mexico for our travel website, Escape Brooklyn. 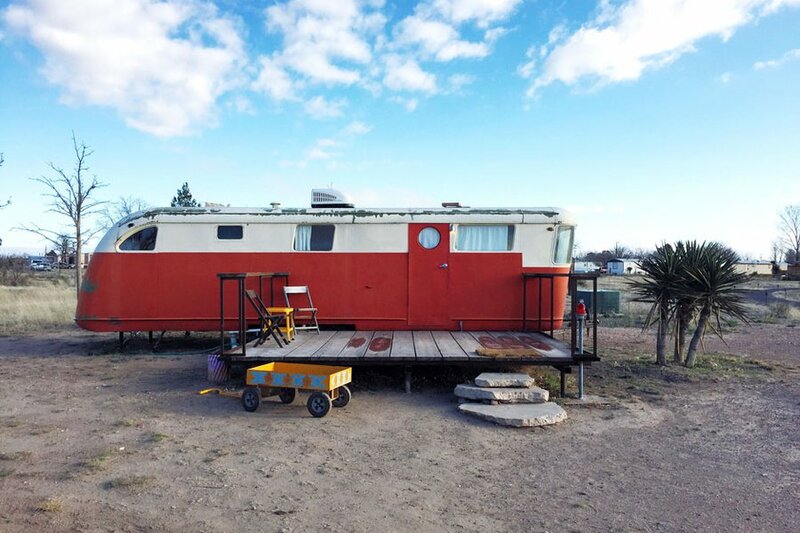 We drove more than a thousand miles in seven days, staying in ghost towns, refurbished vintage trailers, a huge safari tent, and Southwestern-style Adobe cabins. Denny and I had an early-morning flight from LaGuardia, NYC, into Midland, Texas. 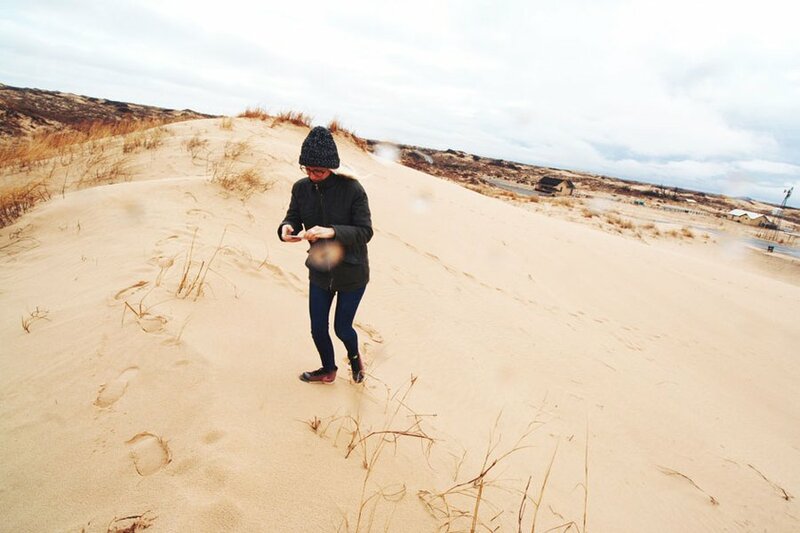 We chose this starting point because of its proximity to Marfa, but our first stop was Monahans Sandhills State Park, which is comprised of 3,840 acres of rolling sand dunes. It's about halfway between Midland and Marfa. 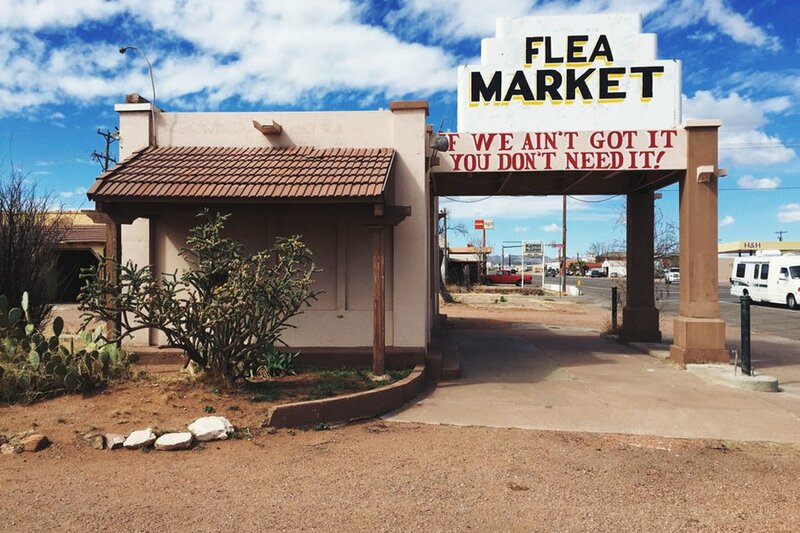 Next stop: Marfa, Texas. 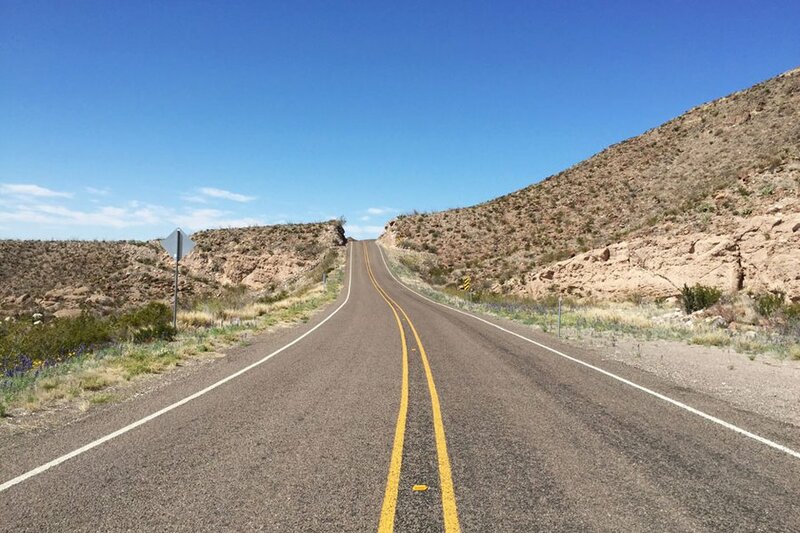 If you're going this route, make sure to take the scenic road through Balmorhea and Fort Davis via I-20W to TX-17S through Davis Mountains State Park. We arrived at El Cosmico in the early evening, settled into our Spartan Mansion, and toasted our seven-day road trip through the Southwest. 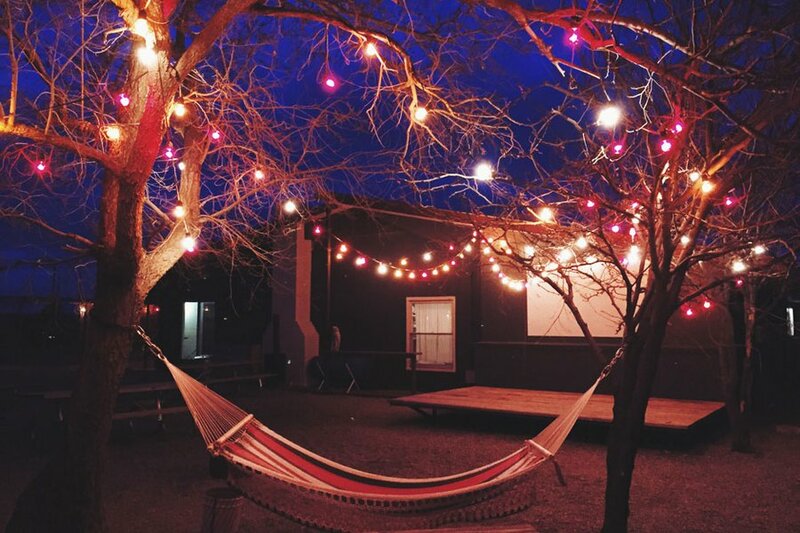 We snapped photos of the grounds on the way out to dinner in town at Cochineal. 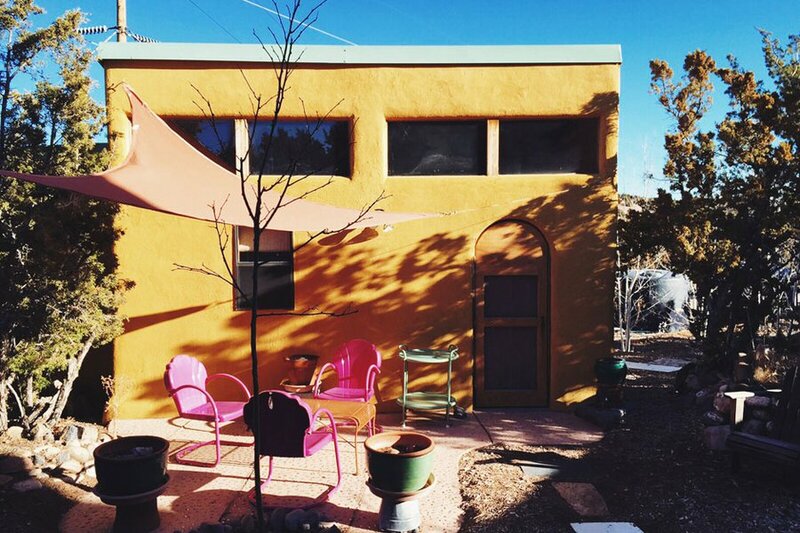 Our first piece of business was exploring the grounds and lodging options at El Cosmico, the most unique hotel we've ever stayed at. It's literally in the middle of nowhere, so even though everything is Instagramable, the vibe here is really easygoing. 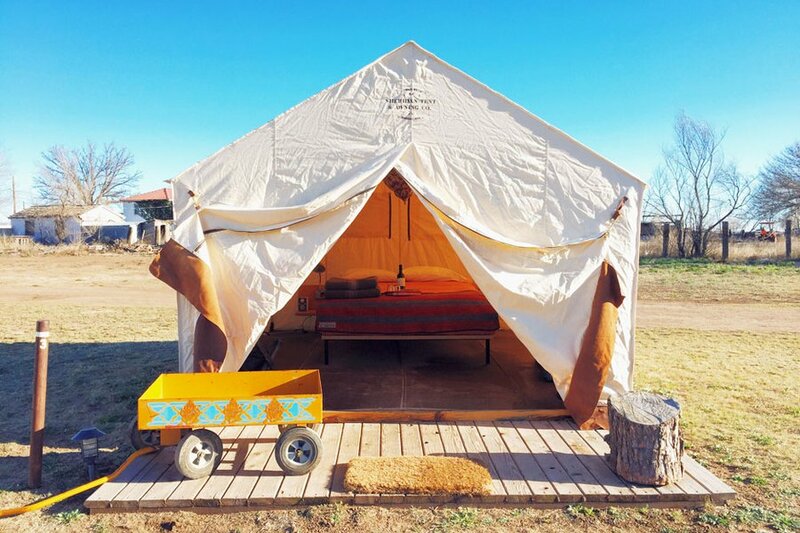 You can make your home-away-from-home in a teepee, safari tent, yurt, or trailer — or you can do like we did and stay in different space every night. 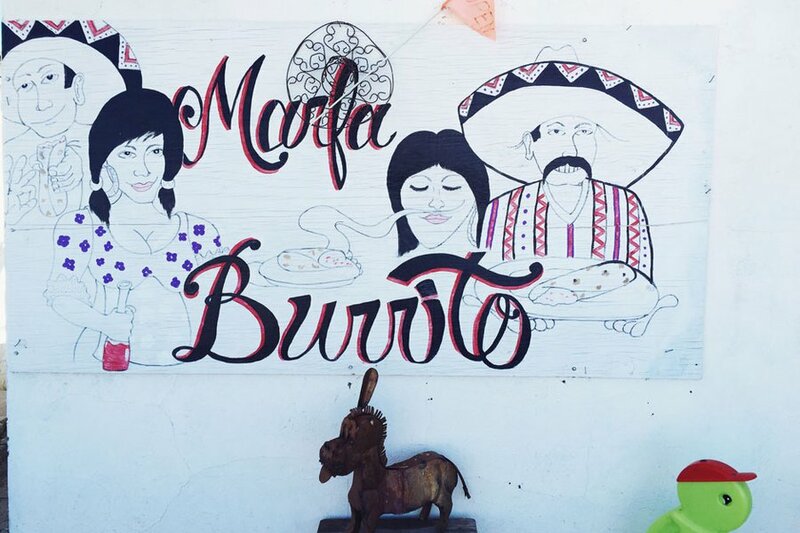 We headed into town for a little shopping — which, by the way, is fantastic — and breakfast at Marfa Burrito. A great place to practice your Spanish and have a killer breakfast burrito. We spent the early afternoon at Chinati Foundation, a contemporary art museum housing huge large-scale installations both indoors and out. 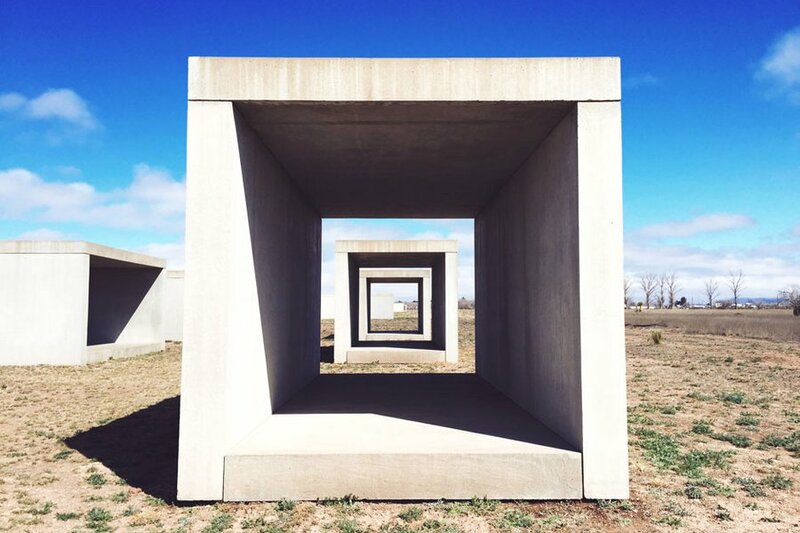 It largely features many works by founder Donald Judd alongside other contemporary artists who spent time in Marfa during the 1980s. We switched lodging at El Cosmico on night two and woke up to the rooster's crow in our safari tent. (Seriously, we then saw the rooster a couple blocks down the road.) The morning was chilly, so we got up with the sunrise and set for our next destination: Big Bend National Park. 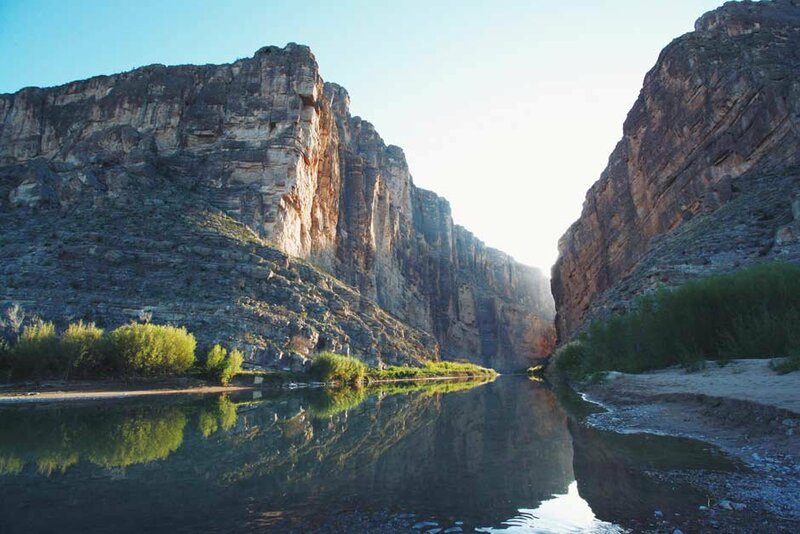 The three-ish hour drive to Big Bend was breathtaking. Roadtrippers tip: If you head down here from Marfa, make sure to take the scenic River Road route, which is only 15 or 20 minutes out of the way. The scenery is worth your while. We arrived in Big Bend National Park by mid afternoon and only had time for a short-ish (two hour) hike at the beautiful Santa Elena Canyon. We spent the night in Terlingua, a tiny ghost town atop a hill inside the park. Again, we rose with the sun to do another hike inside the park. We picked the Lost Mine Trail — which was about five hours. 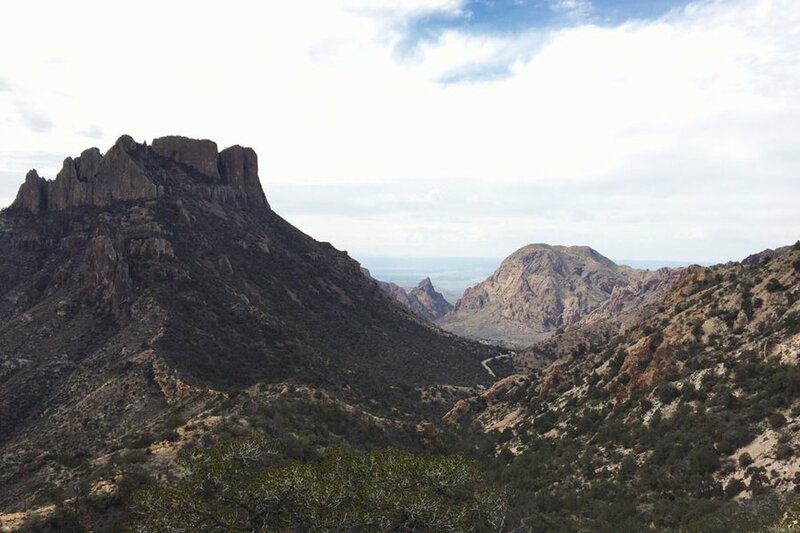 The views at the top were incredible, overlooking several peaks in the Chisos Mountains. We had lunch atop the mountain and made our way down for another afternoon on the road. We stopped at all the funny little roadside gift shops, delis, and trailer parks we saw. Each one felt so authentically Southwestern and, at the same time, like such a time warp. After another long afternoon on the road, we rested our heads in Alpine, Texas. 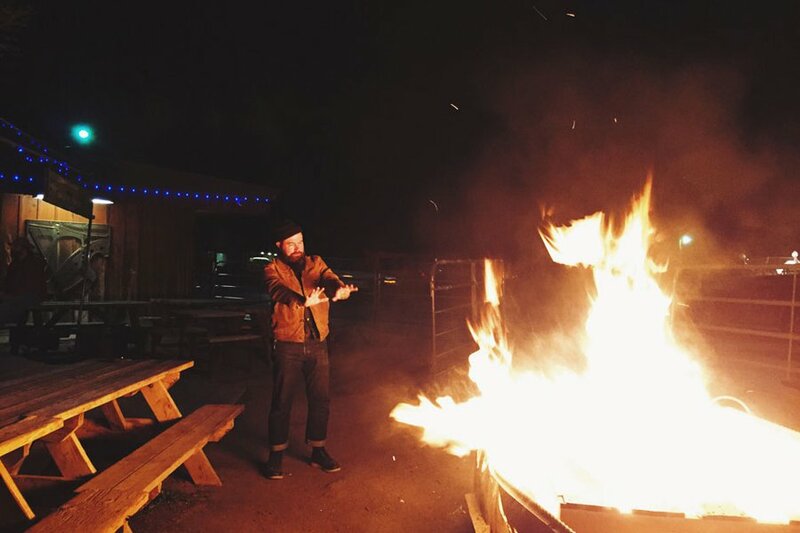 But not before checking out Railroad Blues, the legendary music venue, for a couple beers and a bonfire. It's true what they say — everything's bigger in Texas. The next morning, we passed through El Paso and Las Cruces on our way to New Mexico. It's a four-hour drive non-stop, or a six-hour drive for a photographer. Somewhere along the way, we passed into New Mexico. 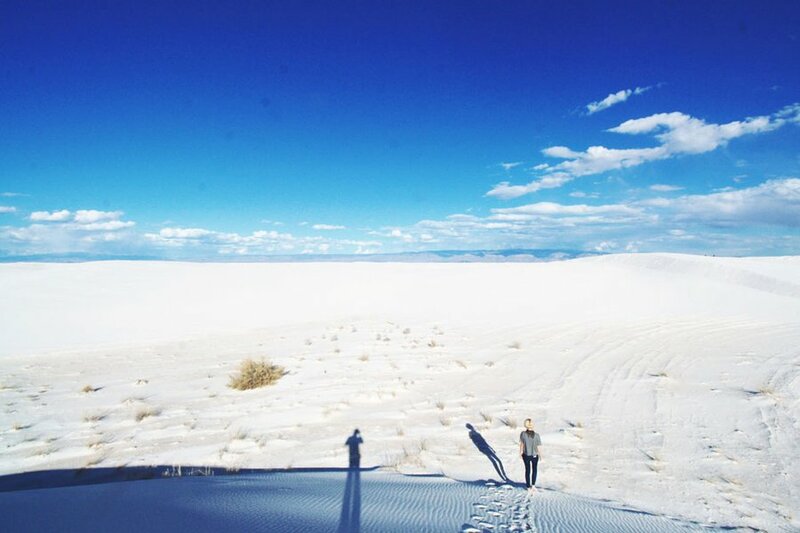 Our first destination was White Sands National Park, which is made up of 275 miles of bright white, rolling sand dunes. The huge dunes are surrounded by mountains, creating an eerie and other-wordly environment. From White Sands, it was another long haul to the small town of Truth or Consequences. 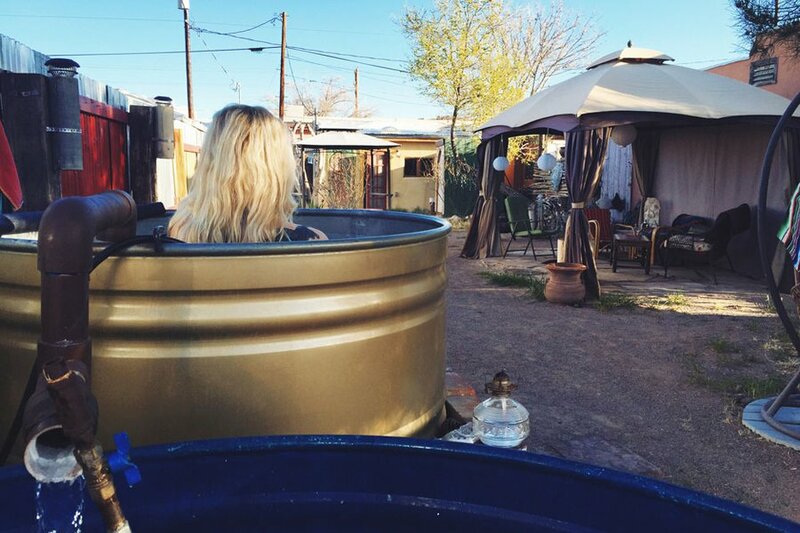 We found a great Airbnb in an adobe cottage called The Garden with a huge outdoor garden that had multiple fire pits, an outdoor shower, and two tubs that drew the town's hot spring water. We indulged in their tubs and all the free baked goods they left us from the amazing Passion Pie Cafe in town. When we finally arrived in Santa Fe, our final destination, we were really excited to settle into our last Airbnb, Suitable Digs. 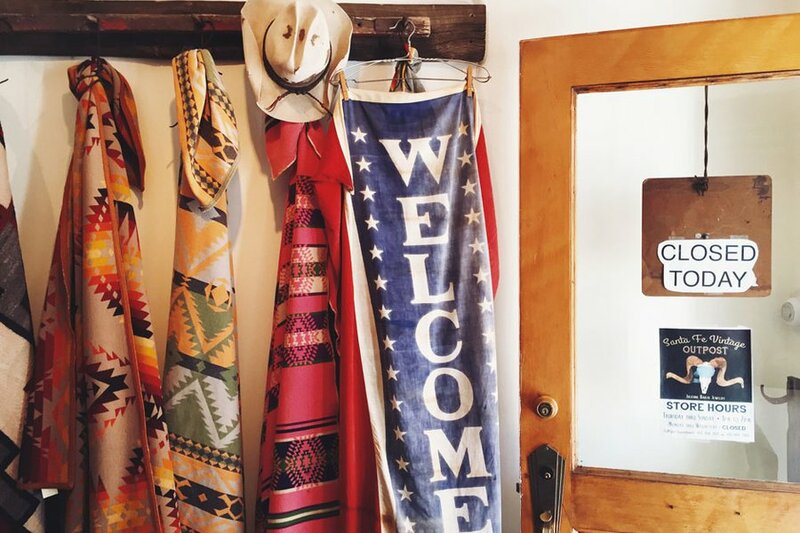 The property is so unique — not only in its cozy, Southwestern retro-ness — but because it is totally green. The owner, Lisa, gave us a tour of her multiple rental properties and gardens, explaining to us how each was green and sustainable. It's just ten minutes from the heart of town, but feels totally secluded. Our last day was spent doing something we didn't have enough time to do in the days before: shopping. 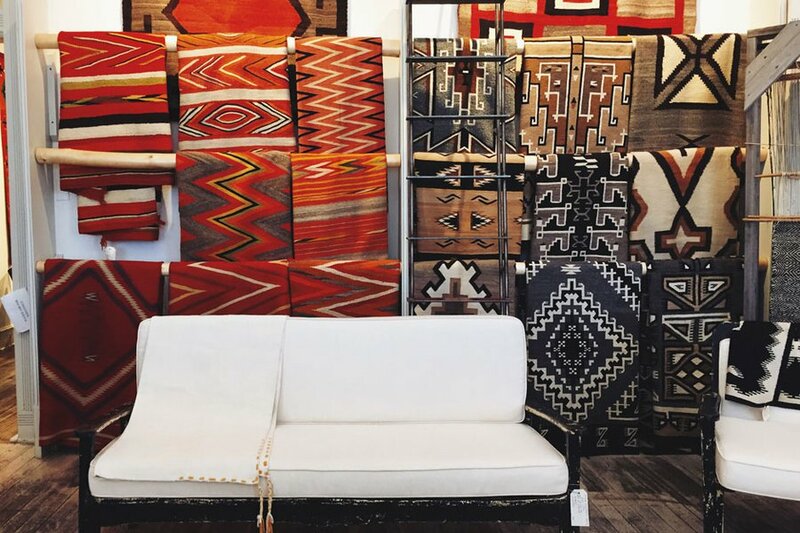 We'd heard really good things about Santa Fe Vintage and spent a few hours in that shop before owner Scott Corey took us to his showroom outside the city. After returning to Santa Fe, we spent another few hours in Shiprock Trading, an impressive gallery of Native American weavings, artifacts, and jewelry. 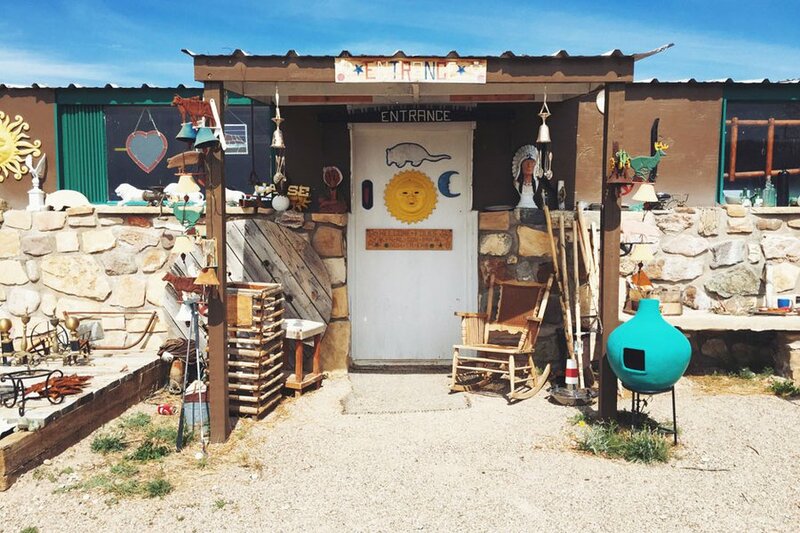 Owner Jed Foutz (a fifth-generation trading post owner) grew up on Navajo land trading textiles, jewelry, pottery, sculpture, basketry, and folk art. We bought our favorite souvenir of the whole trip here: a Santo Domingo necklace. 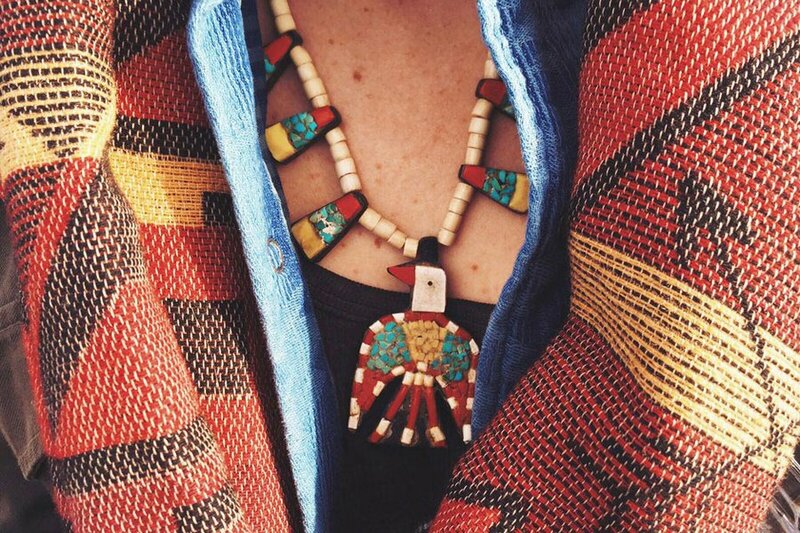 These necklaces were made during the Depression Era, when traditional materials like shell, turquoise, and jet were scarce and artisans crafted souvenir necklaces using whatever was around. Red stone was replaced with repurposed toothbrush handles and Dairy Queen spoons; black was likely a car battery or photograph records. This is a condensed version of Escape Brooklyn's trip. The long version can be found here. Erin and Denny are the New Yorkers behind the travel site Escape Brooklyn. They travel to escape the city, explore new towns, meet people with a story, take the back roads, challenge themselves, photograph, write, and provide others with guides to their favorite places.